CU CHI - In one day of ferocious fighting in the Boi Loi Woods, 6 miles southwest of Go Dau Ha, the 3d Squadron, 4th Cavalry killed 46 NVA and delivered a severe blow to an estimated enemy company. At 7:30 in the morning, A and C troops moved out of their night laager and began to sweep towards an area with heavy underbrush. The two troops had walked about a hundred yards when they found bunkers. Infantrymen riding on the tracks dismounted to search the bunkers which they found were interconnected by tunnels. Suddenly the enemy opened up with machinegun and rifle fire, grenades and RPGs slammed into the troopers from the woodline. Two medics, Specialist 4 Charles H. Jones, Tarkio, Mo., and Specialist 4 James B. O'Keefe, Columbus, Ohio, ran from track to track, treating the wounded while bullets whizzed around them. The armored troopers regrouped. 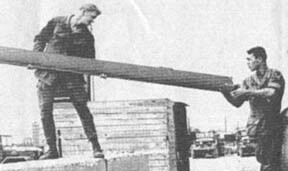 An RPG hit the track of Staff Sergeant Tommy Brewingon, Fayetteville, N.C. He pulled two men out and then refused to leave until everyone had begun moving out of the area. The troopers returned to their night laager position, but still more sporadic sniper fire cracked while the dustoff choppers flew in and out. 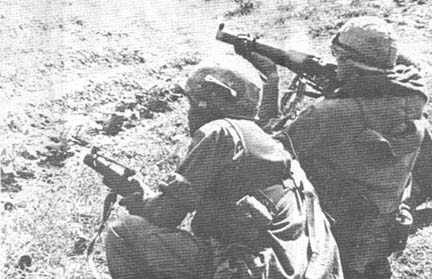 B Troop, which had also come under fire off A and C Troop's right flank, joined the two troops to launch an attack on the entrenched NVA positions. This time the Horsemen decided to attack the enemy on their flank, using a dirt road that circled to he left. As they proceeded, the armored column came under intense fire again. Enemy bunkers lined the whole stretch of road. The Troopers fought back with everything they had. The bunkers were silenced with fire from the tanks' 90mm guns shooting at close range as fast as rounds could be loaded, fired and the shells extracted. Each tank's machineguns, and the .50 caliber machineguns on the APC's plus their M-60 machineguns, and M-16 rifle fire ripped into the enemy positions. A hand grenade lobbed out of one of the enemy bunkers landed on the road between two tracks and exploded. Captain Melvyn Moss of Kingston, N.Y., commander of A Troop, was riding on one of the tracks when the grenade blew. He pulled the pin on one of his grenades and threw it into the bunker. FORMING A SOLID FRONT of steel, tracks of the 3d Squadron, 4th Cavalry, line up in preparation for a sweep toward Charlie's bunkers on an operation near the Cambodian border. 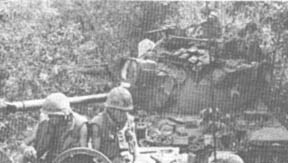 CU CHI - Second brigade tankers from Company A, 2nd Battalion, 34th Armor, moving in after a tactical air strike, recovered the bodies of 13 NVA soldiers. The strike and the sweep took place in the Filhol Plantation northeast of Cu Chi. The bodies were found in and around a series of recently evacuated tunnel complexes. The Dreadnaught force also uncovered 11 individual weapons, documents, ammunition and explosives in the area near the 25th's base camp. One wounded NVA soldier was hiding in a tunnel. Before he could be removed from the tunnel for treatment, the NVA pulled out a hidden grenade. It exploded and killed him instantly. 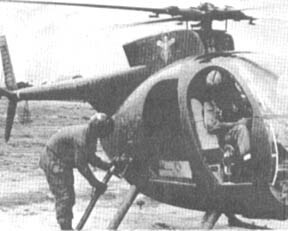 CU CHI - Second Brigade soldiers from the 2d Battalion, 27th Infantry Wolfhounds joined forces with Hornet gunships to kill three VC and detain one suspect. The soldiers had just touched down when the Hornets of the 269th Assault Helicopter Company, covering them, spotted several VC about 800 meters south of them. The gunships engaged the VC and the Bravo Company Wolfhounds quickly moved forward to block any VC trying to escape. "We moved into the area of contact right after the gunships had finished working it over," recalled First Lieutenant Donald Miller, Virginia Beach, Va., the company executive officer. "There were signs of fresh VC activity in the area so we took it slow, checking out everything." The Wolfhounds found two VC killed by the gunships and another had been wounded. The wounded man was patched up and evacuated for treatment. Several items of VC clothing and documents were also found in the immediate area. "Our Kit Carson got excited all of a sudden when he found a little trail leading into thick underbrush," said Sergeant Calvin Cosper, Colgate, Okla. The scout kept saying "beaucoup VC, beaucoup VC," so I put up some security and we went in to search the thicket." Specialist 4 Eddie Thomas, Tupelo, Miss., added, "The trail led us near a trap door that showed signs of recent use, so we figured the VC were in there." Cosper posted Thomas as security and prepared to throw a grenade into the hole. As he lifted the cover, a flurry of bullets came from the hole. The cornered VC opened up with his AK. As the two men prepared again to throw the grenade, the VC poked his head out of the hole and prepared to throw a grenade of his own. Thomas was ready, however and shot the VC before he could throw the grenade. He dropped it back into his hole. It exploded and killed him instantly. A Kit Carson scout then entered the tunnel to search it out. He came up with a 9mm pistol, an AK-47, two flashlights and several documents. Cosper later found that the AK rounds coming from the hole had come pretty close - his steel pot had two dents in it that weren't there when the sweep began. "I was lucky," Cosper said after the experience, "I always wanted to find one of those VC trap doors, but I never thought it would be like this." 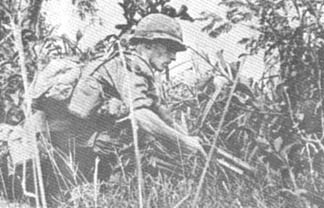 CU CHI - Two platoons of Tropic Lightning soldiers from the Fire Brigade's 2d Battalion, 12th Infantry, beat back a fierce ground assault in a one and one-half hour battle eight miles northwest of Cu Chi. With two squad-sized ambush patrols thrust into the darkness in hope of intercepting a Viet Cong supply element thought to be operating in the Trang Bang area, the Bravo Company Warriors watched the night from their dug-in laager. In the early morning, the VC rained a heavy barrage of mortar and rifle grenade rounds on the Americans. The artillery attack was followed closely by a ground attack by an estimated enemy platoon. "They hit us with heavy small arms and RPG fire. They seemed to be shooting from everywhere," said First Lieutenant Jeffrey Tidd of Cambridge, Ohio. 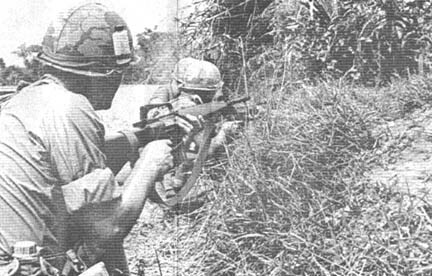 Even through U.S. artillery and gunship support the Viet Cong advanced, but their rush was checked in the last few meters by a fierce return of fire from the warriors. "They got close," Tidd said. "The next morning we found an AK magazine atop a rice paddy dike that formed part of our perimeter." While the Warriors fought for their lives at the night location killing eleven of the enemy, one of the outlying patrols sprung its ambush killing two more. There is no substitute for a safety conscious GI. We in Vietnam face danger from ourselves as well as good ol' Chuck. Careless drivers or a haphazard rifleman can be just as dangerous as the enemy. There are enough hazards over here as it is. Take stock of yourself and wise up to safety in everything you do. It's healthy that way! WHEN YOU'RE NOT using that weapon, make sure lt's cleared! Don't risk your life and your buddies' lives. 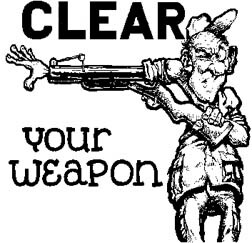 Clear your weapon by checking the chamber. THINK SAFETY ALWAYS. The right and obligation of Americans to defend themselves and their way of life has been recognized from earliest colonial times. During the revolutionary War, training and discipline varied greatly from county to county, and state to state, but the responsibility to bear arms in the defense of the common good was recognized by all. This recognition stemmed from the understanding that men must be responsible if they are to be free. Under our democratic system of government, the majority make the laws, but are also responsible for protecting the rights of minority groups. By the same token, each minority group obeys these laws, whether it agrees with them or not, but works responsibly to insure that its views and unique needs are expressed and understood by the majority. Thomas Jefferson wrote, ". . . though the will of the majority is in all cases to prevail, that will, to be rightful, must be reasonable; the minority possess their equal rights, which equal laws must protect...."
Since Jefferson wrote this, our experience has shown that the members of the minority must proclaim their wants and needs. Otherwise, the majority may lack the knowledge to adequately consider the minority when it makes laws affecting all citizens. In the early days of our country there were some Americans who wanted unrestrained freedom without responsibilities. Thoreau, for example, insisted that a man ought to pay taxes only for those government projects or military operations which he personally approved. Most Americans, although understanding his feelings, have enough common sense to know that his approach, carried to the extreme, would quickly ruin the government. An individual who has voted against putting a traffic signal at a busy intersection is still obliged to obey that signal. Ignoring it would endanger his life and that of his neighbor. Similarly, the majority of Americans has recognized the requirement for military forces to defend our nation. Elaborate procedures have been established to assure that the laws are administered equally and justly. The law requiring military service was established to protect the freedom of all Americans, not just the majority. For this reason, every citizen has a responsibility to serve when called upon to do so. Those who accept this responsibility contribute to America and all that it stands for. What all Americans seek - our vision of the future - is a world at peace. To achieve that vision, we must recognize that the difficult task of building bridges of peaceful cooperation with those who would be our enemies must go hand in hand with the hard, costly and sometimes bloody defense of freedom. Former President Johnson has clearly stated the challenge that confronts America. ". . . human misery and vaulting ambitions combine to threaten peace and security in the world. Much of our effort must be devoted to preventing the forces of aggression from asserting themselves or dealing with them when they do." Specialist 4 Julian G. Gamache distinguished himself by heroic actions on December 18 1968, while serving as a track driver with Company A, 1st Battalion, 5th Infantry. While on a reconnaissance in force mission, Company A came under a massive communist attack. During the initial contact, two tracks were struck by several RPG rounds, wounding the occupants. With complete disregard for his own safety, Gamache maneuvered his track through the bullet-swept area to the disabled vehicles and immediately entered the first track. Extracting the driver, he drove the now flaming armored carrier to a safe position in the rear. Dauntlessly he again exposed himself to the deadly Viet Cong fire as he advanced to the second track, mounted it and proceeded to retrieve the personnel carrier. Gamache continued in this heroic manner for the duration of the fierce battle. His valorous actions contributed immeasurably to the recovery of the valuable equipment and the defeat of the insurgent force. His personal bravery, aggressiveness and devotion to duty are in keeping with the highest traditions of the military service and reflect great credit upon himself, his unit, the 25th Infantry Division and the United States Army. TAY NINH - Not letting success stand in the way of progress, the 4th Battalion, 9th Infantry Manchus have enlarged and improved their battle-tested Mole City outpost. 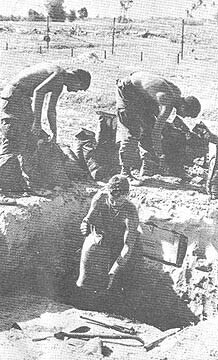 Mole City is the aptly named underground fortress from which troops of the 1st Brigade socked it to an estimated North Vietnamese regiment that tried a midnight attack December 21. During the night-long battle 106 enemy died. Manchu commander Lieutenant Colonel Leo L. Wilson of Salina, Kans., and his Bravo and Charlie companies wanted to hang on to their hard-won plot of ground 16 miles southeast of Tay Ninh near the Cambodian border. And they weren't about to stand pat. "We considered moving the base to several other sites, but after further study decided that Mole City meets all our requirements," Wilson said. "In addition to that, this is ground we've bought with hard fighting, and we have that much more reason to want to hold it." With hard work and cooperation between forward and rear elements, the "rural renewal" of Mole City was accomplished quickly. In ten hours, 12 Chinook and eight Super-Crane helicopter sorties hauled in building materials, supplementing the 27 sorties needed for the first installation. - A facelifting that included extending the perimeter and knocking down palm trees that were in the artillery line of fire. All this required most of the Manchus of Mole City to leave bunkers they'd been working on for three weeks and dig new ones, but they took the move philosophically. "It's a lot of work, but it'll be worth it because we're getting more firepower in here," said Private First Class Clifton E. White of Vici, Okla. "When something has to be done, and you know there's a good reason for it, you don't mind working." Specialist 4 Henry F. Wilson, Nespelem, Wash., saw the move as a chance for some architectural improvement. Surveying his newly dug and covered bunker, he said, "This one looks a lot better than my old one. Now we've got protection and beauty, too!" CU CHI - Radio call signs accompanied by complicated jargon have proved to be confusing but amusing. Newcomers arriving in country find themselves baffled with radio transmissions until they become accustomed to the code. "Bewildered (that's you) this is Big Shot. I'll arrive your location 2000 hours. Have Fat One (the cook) prepare dinner for ten. Inform Alka Sizer (the medical operations officer) that tomorrow's MEDCAP is go! Tell Hungry Eye (a reconnaissance chopper) his mission starts 2330 hours. Fire Power (gunships) will accompany Hungry Eye. Ulcer three (the combat operations officer) will report to me tomorrow's ball game. This is Big Shot - OUT!!" So poor 'Bewildered,' what do you do? Xin Loi!!! DAU TIENG - American infantrymen and Vietnamese from Dau Tieng village fought side by side to snuff out a major fire which threatened the economic life of the community. The blaze broke out shortly after 9 p.m. in the sprawling Michelin rubber factory, 45 miles northwest of Saigon. 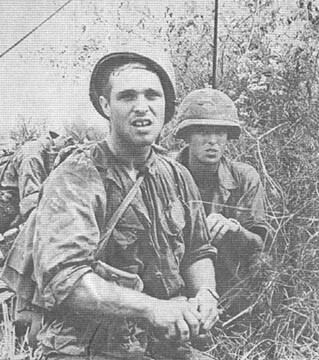 Colonel Louis J. Schelter of Columbus, Ga., commander of the 3d Brigade, committed his resources when it was apparent the Vietnamese would not be able to contain the flames. Volunteers from two infantry battalions, numerous support units and the 142d Engineers Detachment (Fire Fighters), backed up by armored personnel carriers and military police machinegun jeeps, went to the scene of the fire. "It looked as if we might not be able to bring it under control," said Sergeant Jack McGee of Chicago, head of the firefighters. "When we got there the flames were soaring almost 70 feet in the air." Two water trucks from the rubber plantation were feebly attempting to keep pace with the inferno. 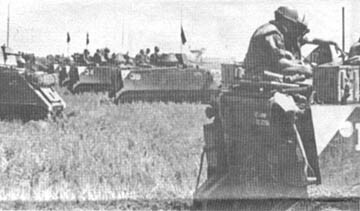 Vietnamese workers and Popular Forces soldiers from Tri Tam district were on the scene when the GIs arrived. As the brigade commander flew overhead in his command and control helicopter directing the operation, all available tank trucks from Dau Tieng base camp provided water for the firefighters. Two walls collapsed as buildings adjoining the blaze were threatened . The firefighters poured more than 20,000 gallons of water onto the fire before bringing it under control shortly before midnight. The intense heat of the fire was blamed on more than 60 tons of high grade rubber which burned, sending clouds of acrid smoke billowing into the night. The heat melted steel beams and a tin roof. An unofficial source attributed the blaze to an electrical short circuit in machinery which operates a series of heated curing ovens at the conclusion of processing. Damage was estimated at more than 400,000 piasters (about $35,000), mostly in damage to the building and machinery. "There is no way to describe the gratitude of these people for the job these soldiers did," said Major Lawrence P. Kenney Jr. of Hancock, N.Y., advisor to Tri Tam district. "The loss of this factory would have been a catastrophe. It employs more than 1,000 workers and is virtually the only industry in this area." TAY NINH - Providing rapid and reliable reconnaissance for the 3d Battalion, 22d Infantry is the job of the Regulars reconnaissance patrol. Daily the patrol covers the area surrounding Fire Support Base Buell north of Tay Ninh, conducting visual reconnaissance and terrain analysis missions. Frequently, the recon team works with the Vietnamese National Police. Specialist 4 William Billiot of Lafitte, La. (who is referred to as "Short Round" by his companions), has completed Tunnel Rat School and searches all underground structures the unit finds. "Because I'm smaller that the other guys, I was always elected to inspect every hole we found," said Billiot. "So I decided that I had better know what I'm doing. I asked for an appointment to attend Tunnel Rat School. Now I'm the official tunnel rat of the patrol." Sergeant George M. Turajlich of Cupertino, Calif., and Sergeant Scott Anderson of Balsin Lake, Wisc., have attended the U.S. Army Special Forces-operated Recondo School in Nha Trang. Undergoing three weeks of strenuous physical training along with reconnaissance training, these two Tropic Lightning soldiers are well qualified to conduct reconnaissance missions. They have shared their knowledge with the other team members to make their operation "just that much better." Dressed in camouflaged fatigues and soft caps, the team scouts look for signs of enemy preparations for attack. Each member knows the terrain and exactly what to look for. The force is led by Staff Sergeant Floyd E. Huff of Pascagola, Miss. "We're forever probing into brush or any other feature which may be used to store weapons or supplies," said Huff. 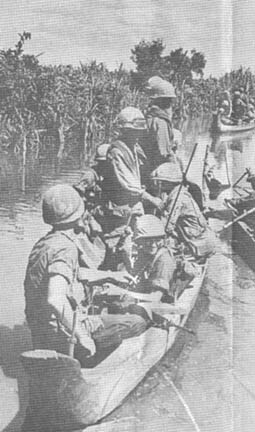 At present the patrol is attempting to acquire two small aluminum boats to probe river banks for enemy caches. "We know the enemy uses waterways to transport his goods. The thick vegetation along the waterways offers ideal hiding places to conceal weapons and supplies. The boats would enable us to cover the banks and search them much faster than swimming or wading," said Huff. CU CHI - A former Viet Cong who decided to rally under the Chieu Hoi program gave Staff Sergeant James R. Logan of Silver Springs, Md., an unusual tale to tell near the end of his tour in Vietnam. Recently Logan, Company B, 1st Battalion (Mechanized), 5th Infantry, was supervising a bunker repair detail near Cu Chi's Ann Margaret gate when he noticed a man waving to him in the distance. Logan explained, "I had just stepped outside the bunker when I spotted a man about 600 meters out signaling to me with his arms." The 2d Brigade soldier said the man was barefooted, wearing a black cotton T-shirt with black pajama trousers. "I noticed him begin to walk forward; he seemed a bit uncertain," Logan continued. The Hoi Chanh was prompted to rally by an airdropped leaflet emphasizing the advantages of Chieu Hoi living, which he held above his head. As it turned out, Logan lived up to what was described on the leaflet. After walking across several meters of open field, the former enemy, still clutching the leaflet, used a three-foot board to scale the five rows of concertina wire in front of the bunkers where Logan greeted him. Private First Class David Gentile, Oklahoma City, and Sergeant Monte Smart, Milo, Maine, were there also, and the three Tropic Lightning soldiers drove the ex-VC to the Chieu Hoi center. At the center, through an interpreter, it was learned that the Hoi Chanh had left his Viet Cong unit near Trung Lap - where he said he was forced to fight. He also said that he brought a weapon that he left near the site where he was initially spotted. Later in the day, First Lieutenant Michael Idol, Los Angeles, with the aid of Specialists 4 Dennis Leuwerke, Garner, Iowa, and Jesse Graig, Benton, Ill., all from the Bobcats C Company, made a search of the area and found a perfectly maintained AK47. Idol remarked, "The area was so wet and heavily covered with wire that it's amazing the man could have made the walk in such a short time." 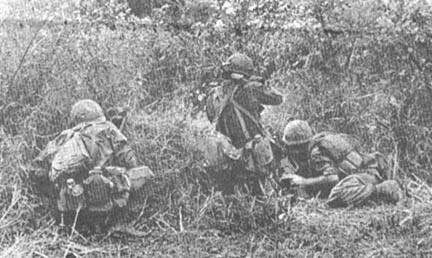 CU CHI - A Charlie Company, 2d Battalion, 27th Infantry Wolfhound ambush resulted in one enemy soldier killed and one captured AK-47. 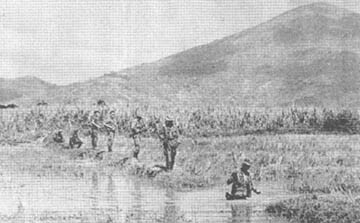 The 1st Platoon had just set up their ambush behind a rice paddy dike facing a road when they spotted movement. 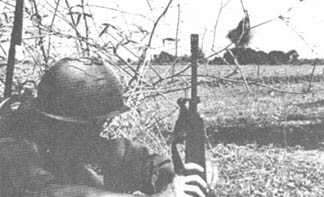 The platoon medic, Specialist 4 Robert Wolff, Elgin, Ill., recalled, "Instead of coming down the road like we had expected, the VC were moving through a marshy area to our rear." The 2d Brigade soldiers repositioned and waited for the enemy to come into range. "We kept an eye on them," said Specialist 4 Tony Orr, Robinsville, N.C., "and also watched the road." "The two VC stopped on the road," related Orr. "I was sure they saw us." "I was trying to get the men organized after the last move," said Sergeant Jimmy Phillips, Muncie, Ind. "Finally I couldn't wait any longer. I opened up with my M-16." After a brief exchange of fire all was quiet. The contact had alerted the VC in the swamp who now moved up on the patrol. Immediately artillery was called in on the enemy who scattered for safety. The platoon spent the night watching for the enemy's return. CU CHI - Second Brigade soldiers from the Battalion, 34th Armor uncovered a munitions cache southwest of Phu Hoa Dong. The Tropic Lightning troopers found one case of AK rounds, one Chicom antitank mine, one 60mm mortar, ten B-40 rockets and two RPG2 rounds encased in plastic. The complex itself had crawlways about four feet high and two rooms six feet high. After the munitions were removed, the complex was destroyed. A further search of the area disclosed the shallow graves of two VC. The graves were approximately three days old. FILL 'ER UP - Specialist 5 William F. Gordon of Paterson, N.J., refuels in Tay Ninh base camp. Tropic Lightning Warrant Officer Ronald K. Benson of Jasper, Minn., looks back from inside the Cayuse. TAY NINH - The Yellowjackets of the 116th Assault Helicopter Company chauffeur everything from battalion commanders to butter brickle ice cream while providing Army aviation support for the 1st Brigade. "We request air mobile assistance for the infantry, coordinate fixed-wing aerial reconnaissance flight, order resuppy by Chinooks and flying cranes, and supply command and control ships for battalion commanders," said Captain Jerry Boyington of Mobile, Ala., commanding officer of the aviation unit. The Yellowjackets air fleet consists of four OH-A Cayuse helicopters. "Their high speed, powerful turbine engines and sleek airflow design make them ideally suited for the job of supervising and controlling infantry troops as they conduct their ground operations against the enemy," said Staff Sergeant Norman Dennis of Ionia, Mich., maintenance supervisor. "If a battalion is in contact with the enemy and the commander's command and control ship needs refueling, we go in and land another ship, even in unsecured areas, and have the commander switch aircraft rather than waste time going back to refuel. "We make sure that the troops' commander is in the air when his control and guidance is needed most," said Boyington. 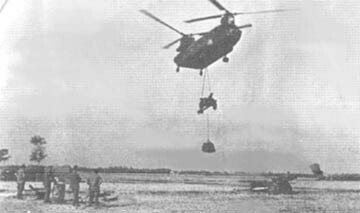 While shuttling commanders back and forth from the Tay Ninh base camp and their forward locations the aviators have been called upon to deliver some unusual cargo. "We've taken captured weapons back from areas of contact and have delivered rice to distressed villagers," said Warrant Officer John Liguori of Nyack, N.Y., one of the regular pilots for the detachment. Specialist 5 Michael Myers of Mt. Clemens, Mich., Specialist 5 William Gordon of Paterson, N.J., and Specialist 4 William Newman of Columbus, Ohio, all make the Yellowjacket unit a beehive of activity. Many members of the unit have distinguished themselves in combat while with the 25th Division. Captain Boyington has received a Distinguished Service Cross for using his smoke screening helicopter to conceal the friendly troops under extremely hazardous conditions and for using his ship as a decoy to draw enemy fire. Warrant Officer Grant S. Parmalee of Boston, N.Y., has received a Distinguished Flying Cross and a Silver Star for heroic acts while flying for the 1st Brigade. During December the Yellowjacket command and control ships flew 534 hours, 616 missions, 1,553 sorties and shuttled 1.120 passengers, in addition to carrying 10,000 pounds of assorted cargo, "including the ice cream" quipped Boyington, as he climbed aboard to make the daily courier run to Division headquarters in Cu Chi. 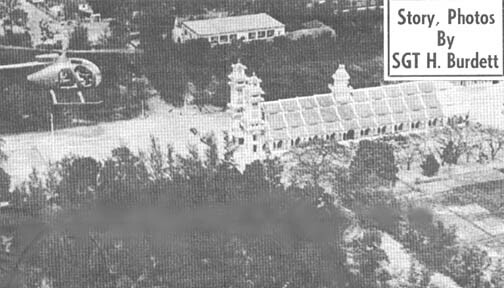 FAMOUS TEMPLE - A Yellowjacket command and control ship approaches the historic Cao Dai Temple on its way to deliver a battalion commander to Tropic Lightning's Fire Support Base Mitchell, south of Tay Ninh City. The Yellowjockets chauffeur everything from battallion commanders to butter brickle ice cream. 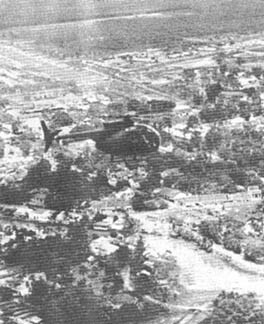 OVERVIEW - While on an aerial photo reconnaissance mission, 1st Brigade Yellowjackets fly over Tay Ninh City. Province Headquarters, as well as other government buildings, can be seen in the background, along with the Division's Tay Ninh East airfield. REPAIR TIME - Specialist 4 William Newman of Columbus, Ohio (left), and Specialist 5 Michael Myers of Mt. Clemens, Mich., both crew chiefs, replace a rotor blade on a temporarily grounded Cayuse. HOVERING - While a sister ship waits in the wings, a Cayuse command and control ship hovers impatiently just before taking off in the direction of Viking Resupply Pad to pick up some valuable medical supplies. The choppers support the 1st Brigade. CU CHI - One of the surest ways to defeat an elusive enemy is to eliminate his hiding places. During an 18-day operation in the Citadel and An Phu areas northwest of Cu Chi, the 50lst Engineer Company (Land Clearing) of the 62d Engineer Battalion cleared nearly 9,848 acres of overgrown, enemy-infested land. The task was accomplished by Rome Plows - small bulldozer-like machines that cut down and plow under any brush and trees that get in the way. The Citadel, long-time haven for the enemy and his equipment, consisted of vast overgrown hedgerows in which crafty VC and NVA soldiers dug huge tunnel and bunker complexes. The land clearing company operated in three teams, each having nine plows and one bull blade (a plow especially adapted to move large trees and heavy obstacles). 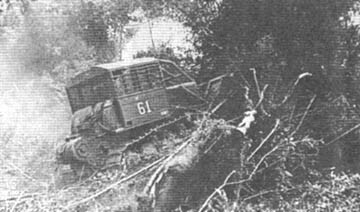 Maneuvering through dense hedgerow complexes the plows are directed by First Lieutenant Kenneth Steen, Du Mont, N.J., the company commander. By radio, Steen directs the plows' movements by using identifying numbers stenciled on the cab. Fire Brigade soldiers from the 1st Battalion (Mechanized), 5th Infantry, and the 2d Battalion, 12th Infantry, provided security for the engineers throughout the operation. As the teams moved through the area they destroyed 1,168 sniper holes and 902 bunkers along with 3,715 meters of trenchline and 1,150 meters of underground tunnels. In the area there were numerous weapons and munitions uncovered including 14 assorted "dud" rounds, 15 booby traps, 11 mines, 200 blasting caps and 7,340 assorted munitions rounds. The Tropic Lightning soldiers and the engineers also found more than 301,000 piasters of Charlie's money. The project wasn't entirely destructive either. Constructive plans are in the making to assist the villagers to develop and cultivate the cleared land. In 18 days, the 501st Engineer Company and 2d Brigade soldiers eliminated many future hazards to allied troops, disorganizing Charlie's infiltration system and depriving him of needed cover. TAY NINH - Even as Division combat troops were cornering an estimated VC company that brutally attacked two pro-government hamlets 35 miles southeast of Tay Ninh, Tropic Lightning Civic Action forces were helping the hamlets' people start to rebuild. Coordinating the civic action work was Specialist 4 Lynn B. Johnson, Santa Cruz, Calif., who serves as the NCOIC of the 4th Battalion, 9th Infantry Manchus S-5 (Civic Action Section). He was already working to find food for the refugees from Binh Hoa and Binh Thuan hamlets as elements from the Manchus and 3d Squadron, 4th Cavalry, closed in on the hit-and-run Viet Cong force. (They finally trapped the Communists and killed 19 of them in an early morning battle). The refugees were fleeing from an attack that had left one of their hamlet chiefs dead and several entire families slaughtered. They traveled four miles to Go Dau Ha, which had also been hit by wanton VC mortar fire that killed two small boys. Go Dau Ha, however, was protected from ground attack by a local ARVN force and Combined Reconnaissance and Intelligence Patrol (CRIP). It is also Johnson's base of operation, so when 1,000 hungry refugees showed up at an old Buddhist temple in the village, he was ready. He collected food from the CRIP and from MACV Advisory Team #33, which works with the Go Dau Ha ARVN force. 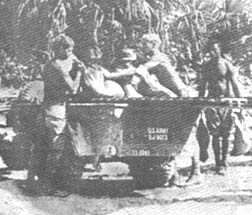 Before the day was out, Johnson had also processed 11,000 pounds of food sent from Cu Chi by truck by the Division Support Command and 500 pounds procured hastily by the Manchu mess hall at Tay Ninh base camp and sent out with the CRIP resupply convoy. With the help of a local Cao Dai clergyman, Johnson distributed part of the food to refugees, many of whom had already started back to rebuild their hamlets and trucked the rest to the people who had stayed in Binh Hoa and Binh Thuan. The next day, the 1st Brigade troops mounted a MEDCAP (Medical Civic Action Program) right where it was most needed - in Binh Hoa. The Manchus' veteran MEDCAP leader, Specialist 5 Mike Devine, Girardville, Pa., treated 120 patients in the place where people had learned the hard way how the Viet Cong treat innocent civilians. Returning to Tay Ninh he enlisted the help of Private First Class William Bruce, Grafton, Wisc., the Manchu headquarters company mail clerk, and obtained a ton of assorted dried foods from the 1st Brigade headquarters. ¾ Cav . . .
the air. A piece of shrapnel cut into Captain Moss's back, but he shook the pain off and continued to give commands into the radio. A tank was hit by an RPG and stopped in the middle of the trail, blocking the way for vehicles behind it. Specialist 4 John Johnson of Philadelphia, Pa. and Private First Class Donald R. Harris of West Point, Va., ran through the heaviest part of the fire and Johnson drove the tank off the road while Harris directed him from the cupola. Platoon Sergeant Samuel G. Jenkins of Quincy, Ill., continued pouring out fire at an incredible rate. First Lieutenant John R. Moore of Orange Grove, Calif., commanding the first platoon, remained cool throughout the battle, and thus helped to keep everyone else calm. "Those were the guys who really had to come through," explained First Lieutenant Jerome Klar of San Antonio, Texas, the forward observer. "The only way to bust up an ambush is to overpower the enemy with fire." 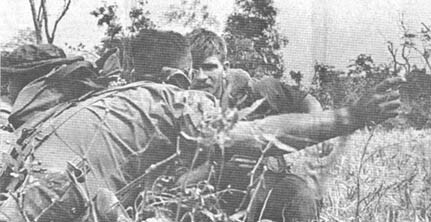 The heavy fighting ended around 3:30 pm after the Cav troopers broke the back of the NVA defenses. Forty-six enemy bodies were found. Several AK47s, an RPG launcher, a machinegun with ammunition and hand grenades were captured.